I’m thrilled to have my good friend Anna back on the blog! So excited to discuss her upcoming novel, Before—the fifth book in a series that has captivated readers around the globe. Before explores Hardin Scott’s life before Tessa and delivers new insight into their turbulent, but epic relationship. Written in Hardin’s point-of-view, the novel will certainly hold some surprises for devoted fans. Vilma: Hi Anna!!! It’s been awhile since I officially interviewed you in my tiny office at home! 😉 Things were already pretty crazy and I know things have only gotten crazier—in a good way—since we talked then! Anna: Hey lady! It has been a while. It’s crazy to think that our little makeshift interview was a year ago! They have gotten so much crazier, but I’m loving every moment! Vilma: So let’s talk about your super exciting new release! How did the idea for BEFORE come about? And when did the idea first start to percolate? Anna: The idea came a long time ago actually. I started writing this before I even had a publishing deal. I promised my readers on Wattpad that I would show them what Hardin was feeling in the beginning. They wanted to read his thoughts from the first book so badly, so I told them I would give it to them when I finished the other books. I wrote the first chapter over a year and a half ago, but then I got busier and busier and busier, so it took a while haha! Anna: My main concerns were not softening him too much in the beginning. By the time I had actually dived into writing this novel, I had already written Hardin as he grew throughout the novels. My little broken boy was now a responsible and kind man, so it was so strange to go back to how he used to think and I didn’t want to soften that for the sake of “romance”. There’s such a fine line and Hardin doesn’t shy away from it. Vilma: There is a lot we’ll see from Hardin before he met Tessa, as well as some new content during their tempestuous coming together. Anything you can share with us? Vilma: What do you hope readers will walk away with after they read BEFORE? Anna: I hope they will feel closure with Hessa and they will understand how Hardin came to be, well.. Hardin. Vilma: You are always busy, juggling multiple projects, anything you can share with us in terms of what else is coming up for you? Anna: I’m not as busy as you! I should ask you this question. lol. I can say that I’m finishing up two books about Landon’s character from After but they will be considered their own story. You don’t have to read After to read Nothing More or Nothing Less in 2016. Vilma: Okay, friend. Let’s get the scoop on the movie!!! Vilma: Sooo… big question!!! 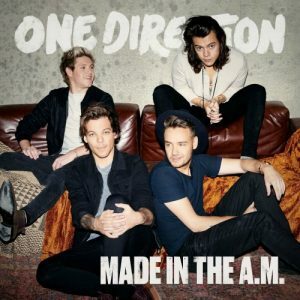 The One Direction album “Made In The A.M.” dropped last month! What are your thoughts so far? Any favorite song? Anna: Eek! I freaking love it. At first I was sure that I was confused and accidentally played Fleetwood Mac. It’s awesome and I’m proud of them. My favorite song is Wolves. Anna: haha. Just hanging out with friends, *bats lashes at you* and I’m going to get a Christmas tree this week. I lost mine. Like we literally lost ours and can’t find it haha. I also have lots of writing for books and other fun things. Vilma: Thank you so much for talking to me and to the readers! We are all looking forward to release day!!! Book Five of the After series—Anna Todd’s Wattpad fanfiction that racked up 1 billion reads online and captivated romance readers across the globe! 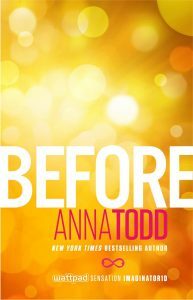 Before explores Hardin Scott’s life before Tessa, reveals what happens after After, and gives new insights on their turbulent #Hessa romance. 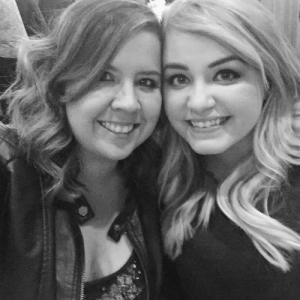 Cosmopolitan called Anna Todd “the biggest literary phenom of her generation.” That’s Normal declared Hardin and Tessa “The Mr. Darcy and Lizzy Bennet of our time.” Revel in the awesome, messy power of true love. BEFORE Hardin met Tessa he was a raging storm. DURING those first moments they met, he realized he needed to keep her for himself—his life depended on it. AFTER they got together, the world would never be the same. Hardin and Tessa’s dramatic love affair became a vortex pulling in everyone around them. For the first time these others are given voice as they appear before, during, and after the events in original After novels. Alongside them, Hardin’s account of his first encounters with Tessa—which will change what you thought you knew about the brooding boy and the angel who loved him.